On Thursday, the 12th June 2014, IRDG members have the exclusive opportunity to participate in an Innovation Practice Group visit to Irish Distillers. 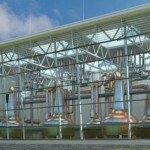 As well as a grand tour of the highly impressive and unique facilities at Midleton, guests will have the opportunity to meet the people behind the expansion project, learn about the approach to product and process Innovation at Irish Distillers, and meet other IRDG members interested in Innovation. Further details about the Irish Distillers, the Midleton Distillery and the company’s approach to Product and Process Innovation is available below the booking window. We look forward to another really insightful and valuable visit to an IRDG member company. In 1988, Irish Distillers joined the Pernod Ricard family. At this time, Jameson sold 466,000 cases globally, with Ireland as its main market. Following years of consistent and sustained investment, Jameson sale volumes reached 4.3 million cases in 2012; the equivalent of 51 million bottles. By now, the distillery in Midleton where Jameson is produced had reached full capacity. And so, in recent years €100 million has been invested by Irish Distillers in the Midleton Distillery. A further €100 million was also invested in the construction of a nearby maturation facility in Dungourney. The new distillery is located on the 128 acre site and is one of the largest projects undertaken by the company since it was formed in 1966. The Innovation Team at Irish Distillers has conducted a wide range of research and innovation work over these past three years principally to support this expansion of Midleton Distillery. A significant amount of process innovation took place involving pilot distillation and brewing facilities. Novel production technologies were tested and subsequently applied into operations. Maximising energy efficiency was paramount also, and achieved, whilst ensuring no impact on product quality. In addition to the development of new distillates to meet future evolution in whiskey tastes, Midleton Distillery is active in co-operation with marketing to bring new whiskies to the market. This is especially true for premium single pot still whiskey which have helped forge a renaissance in Irish Whiskey over the past decade.